After the low opening weekend, recent offering of Kapil Sharma Firangi got failed to remain steady in weekdays and completed the first week on a disappointing note. Despite not having any strong contender in opposite, this period drama struggled a lot to divert audience toward itself across India except Delhi & Punjab circuits. Directed by Rajiev Dhingra, Firangi is a romantic period drama set in the year 1920 when Britishers were ruling India. Unlike Kapil’s first film Kis Kisko Pyaar Karoon (2015), this one was released with low hype and hasn’t got succeed to impress critics as well as audience. As a result, it has taken a week to surpass the opening day business of KKPK (10.15 crores). 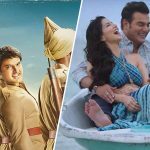 After slow start, Firangi remained flat over the weekend due to unfavorable public response and did the business of total 6.60 crores that included 2.10 crores of Friday, 2 crores of Saturday and 2.50 crores of Sunday from 1150 screens across the country. Then in weekdays, asusual the film witnessed abrupt drop in footfalls and raked the business of 1.15 crore on Monday, 1 crore on Tuesday and 0.85 crore on Wednesday. On the last day i.e. Thursday, with further dip Firangi minted 0.70 crore and raised it’s one week total collection to 10.30 crores at domestic box office. While the adjacent Hindi film, director Raajeev Walia’s Tera Intezaar has also got failed to entertain audience and received poor response at box office. In the opening weekend, it did the business of 1.50 crore with 0.50 crore on Friday, 0.45 crore on Saturday and 0.55 crore on Sunday. In weekdays due to normal working days, it reported more lesser occupancy in theaters and bagged the amount of 0.25 crore on Monday, 0.25 crore on Tuesday, 0.20 crore on Wednesday and 0.18 crore on Thursday. With this, total one week domestic collection of Tera Intezaar has become 2.38 crores.